This is Page 5 of a 10-page review. Click on the black links below to visit other pages. This product line comes from an eponymous natural restaurant in Binghamton, New York that closes for business Sundays and Mondays in order to turn its kitchen into pesto production central. 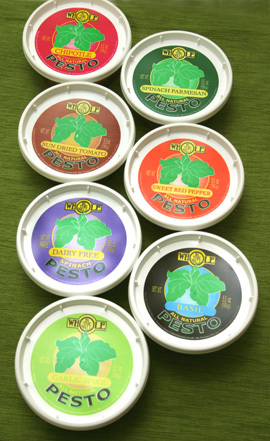 They make seven kinds, and there are a few we think no pesto aficionado should be without. The pale, bright green and almost transparent Garlic Spike Pesto, a seasonal variety that consists mainly of scapes, the shoots that grow from the tops of garlic late June, was the lightest and most refreshing of all our finalists. More purée than paste (it wasn’t tacky at all), we use it anywhere chopped garlic would go. It’s not as strong as regular garlic, so feel free to pile it on. We also loved the Spinach Parmesan Pesto, a thick, smooth, garlic-laden blend that tastes like the best creamed spinach we ever had. They also make a leaner, though equally garlicky, Dairy-Free Spinach Pesto. Either would make a perfect filling for a chicken roulade and a heavenly match for your favorite starchy vegetable. 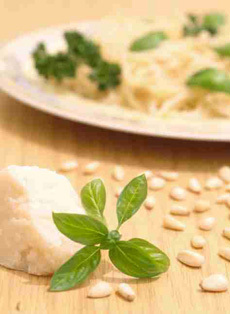 All of the pestos contain a bit of butter for creaminess and are, fittingly, studded with whole pine nuts. Visit WholeInTheWall.com for more information and to purchase online.